Yet another comic book movie is churned out of the Marvel Machine as Thor is launched on the big screen. I for one am not a big comic book guy. Was never really into reading them when I was young (more into the baseball card / video game thing) but I do find several of the recent Hollywood adaptations entertaining. However, for every Iron Man, Spider-Man 2 and Dark Knight that gets made we also have to deal with Iron Man 2, Spider-Man 3 and X-Men Wolverine. Basically it seems that comic book movies are a crap shoot these days. 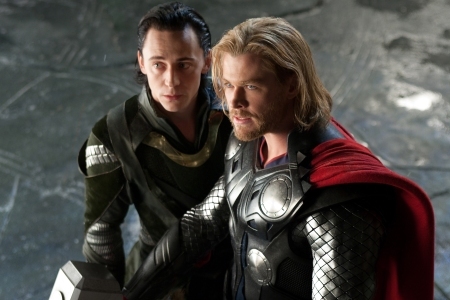 With Thor, thankfully we get an origin story done right and in the capable directing hands of Kenneth Branagh. This movie is very entertaining, well paced and completely powered by it's breakthrough star Chris Hemsworth. I had a faint glimmer of knowledge regarding the back story of Thor. I knew he was a norse god with a hammer and a helmet with wings on it. We don't see the helmet at all in the film (strange) but we get all the hammer-wielding action you would expect from a big screen Thor blockbuster. The entire movie is split between action on present-day Earth and parallel story elements set in the fictional realm of Asgard. Thor has been banished to Earth by his father (a well-cast Anthony Hopkins) for basically acting like a brash teenager. On Earth (in New Mexico of all places) he struggles to find humility and to once again become reunited with his hammer. In the process he meets Natalie Portman and Stellan Skarsgard (part of a team of pair of scientists) and quickly falls in love with Portman. The rest of the plot revolves around Thor's evil brother Loki who tries to steal the throne of Asgard from Odin (Hopkins) and kill Thor on Earth by sending a mechanical giant named Destroyer. Yeah, I know this all sounds hokey and nerdy and some of it is. But the whole presentation is very slick with strong visual effects and some good acting overall. Surprisingly, Natalie Portman delivers the most wooden performance fresh from her Oscar winning turn in Black Swan. Clocking in at around two hours, Thor seems to go by much faster which is a testament to the directing of Branagh. Hemsworth is a total find as the lead actor in this movie. You may remember the Austrailian newcomer from J.J. Abrams' Star Trek in which he played Captain Kirk's father at the beginning of the film. Here he gets a chance to shine and totally owns the role of Thor both as a physical presence and with quick and sharp wit that bring some much needed humor to the film. This does seem like this is a role he was born to play. And looking at the upcoming Avengers superhero mashup and two follow-on Thor sequels in the works, Hemsworth will be very busy with the hammer for years to come. Overall this is one of the better comic book adaptations I've seen. Solid action throughout and a very entertaining ride for the audience. I saw this in 3D unfortunately (due to showtime conflicts) and was forced to watch the dim visuals through a pair of glasses. I am so over 3D that I try to avoid it at all cost. Something about the glasses just dulls the overall luster of the film for me. Regardless, this is a strong enough movie to garner a 4 out of 5 JR rating for me. Make sure you see this in the theater to enjoy the visuals and sound on the big stage.